UPDATE: The BAL project has now been redesigned, check the BAL section on the header to see the changes! So after successfully completing my RGB LED strip lights, I was at a loss for what project to embark on next. I wanted to make something a bit more flashy, and a bit more well built. That is when I saw this video from Sparkfun, where they used an RN-52 Bluetooth module to stream audio directly from a phone into speakers. Now this on it's own is no real use to me, but streaming it to an audio jack where I could plug in headphones or plug it into my full speaker system at home? That's useful (and cool)!!! The design is chiefly pretty much the same as the sparkfun circuit, but instead of streaming it out to speakers, it has an audio jack. It also has a DC power jack with an onboard 3.3V supply. The switch is used to switch it between programming mode and normal mode. 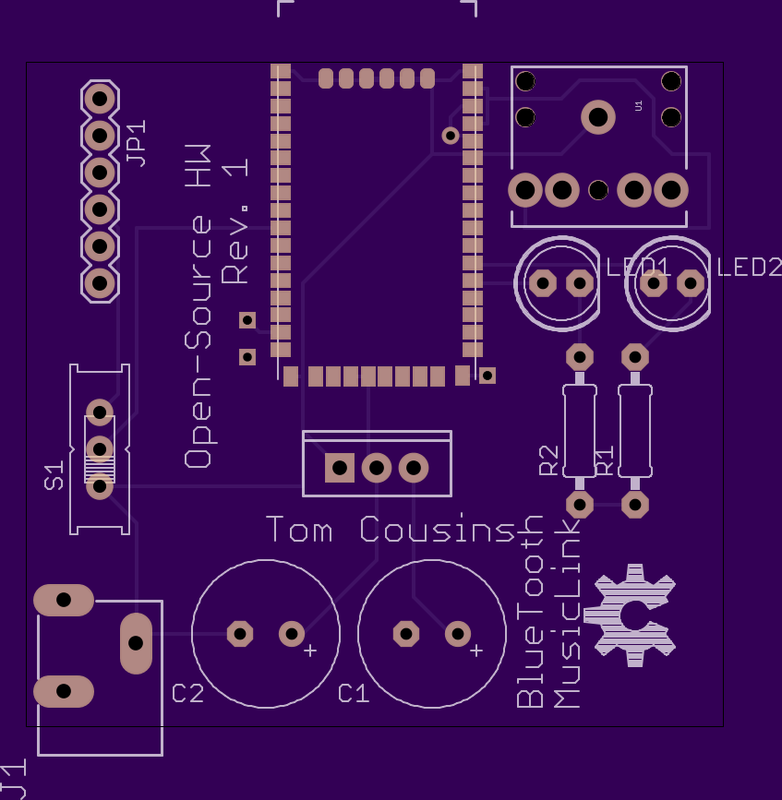 As of yet, whilst I am still prototyping it, most of the components are through-hole, but if you want to order the board to try it out, it is available from OSHPark (which is where I ordered mine from). WARNING, on the silkscreen, the LED's are backwards, if you order it make sure you put them the other way! If you wish to make a board professionally, I seriously recommend OSHPark! They have amazing quality, and amazing prices too, and if you are not fussed about waiting, free international shipping. They are also run by a pretty cool guy called Laen, who is great. Did you experience a lot of RF noise from the speakers? I haven’t experienced this issue, no. Are you sure it’s coming from the module and not the speaker system? Did you experience a lot of noise from the module when speakers were attached? Nice job with the project. 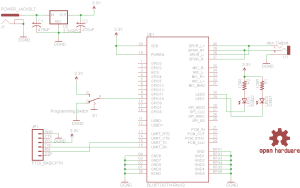 RN52 is an amazing component, makes a lot things easier. You said that OSH Park have made your board, and their prices really are amazing. But the soldering was made by you? Or by them? If it was you, how did you do it? Those kind of pads aren’t that easy to work with, right? I really need some help here! Yes, I did the soldering myself, and you’re right, they really aren’t easy to work with! My tip for you is to buy some solderwick (so it doesn’t matter as much if you mess up you can just wick it back up) and a nice small tip for your soldering iron. Flux helps too! Then just have a go! The more you do it, the better you’ll get. Also, make sure you don’t put too much solder on each pad, it doesn’t take alot to make the connection and over-doing it just leads to bridged pads. Good luck! Let me know how it goes! 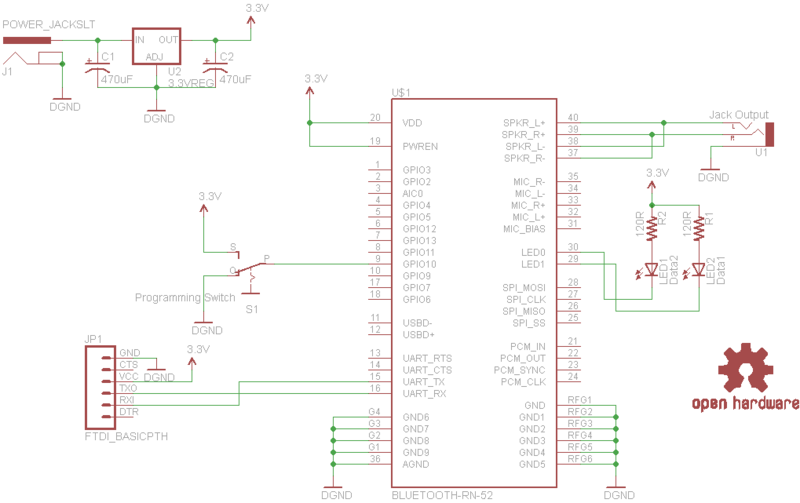 Can we transfer data to uart and also stream music using module? Yes you should be able to! Hi, your project is very interesting. But for me this is the first time with bluetooth. Do we absolutely need to program the RN-52 to use it with a phone like you do in the video? No it should work off the bat 🙂 it’s only if you want to do more complex things you will have to program it. Let me know how it goes! Great!! Thanks a lot. My project is still in creation, but I’ll publish it at oshpark.com when it will done! Hi, neat board! Easy module to hook up on any project. I also did a board for the rn-52 module while I was waiting for sparkfun to release a board (actually my first board 🙂 ). 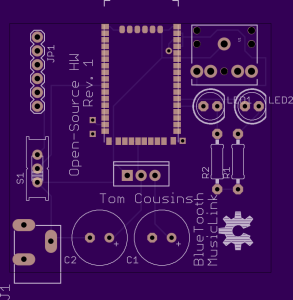 You might like it, It’s essentially a part of the rn-52ek board but as small as I could make it. Now I’m planning to merge it with a arduino pro mini for a bluetooth headphones project. That project looks great! I may order it, did you solder it up with an iron or in a reflow oven (or homebrew equivilent)? Let me know how it comes along! I’d be really interested to know how that goes!